Home English Bulletin First schedule of ‘F2’ wrapped up! The first schedule of ‘F2 – Fun & Frustration’ has been wrapped up. Director Anil Ravipudi took it on his official Twitter handle and shared this update. 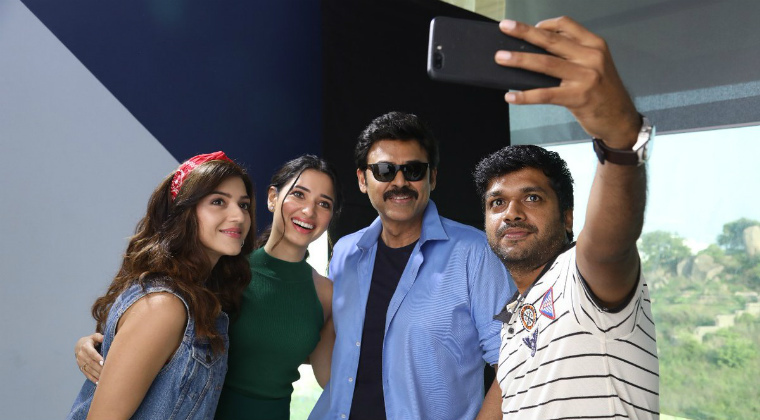 Scenes involving the lead cast, Venkatesh, Varun Tej, Tamannaah and Mehreen were shot in this first schedule which last for two weeks. Devi Sri Prasad is composing music for ‘F2’ which is going to hit the screens for Sankranthi 2019. ‘Dil’ Raju is producing the movie under Sri Venkateswara Creations banner. Previous articleఆట‌గ‌ద‌రా శివ‌ రివ్యూ: ఆట బాగానే ఉంది కానీ.. కానీ.. కానీ..! Next articleన‌ర్త‌న‌శాల‌.. రెడీ టూ రిలీజ్..!